Bejan revisits these early modern times of extreme verbal violence, sectarianism, and bloodshed with an eye on our own. Her brilliant re-reading of John Locke and Thomas Hobbes and her rescue of the lesser-known Roger Williams from the distorting clutches of Martha Nussbaum, et al. result in her careful endorsement of an “evangelical mode and motivation of conversational engagement” as a way to address our contemporary “crisis of civility,” one that “seems uniquely well-suited to explain—and to sustain—a commitment to ongoing, active, and often heated disagreement in the public sphere.” She deserves congratulations for the feat of cultivating such succulent fruit in the overworked field of scholarship on early modern political thought and “toleration” studies. If by their fruits ye shall know them, then Bejan’s book shows her to be a brilliant scholar of Locke, Hobbes, and Williams, a great evangelist for the importance of historicizing in a new way, and a daring and original thinker of the first order. She also writes beautifully; her dry wit and perfectly turned phrases make reading this book a true pleasure. Her careful reading of Williams’s rather uncivil and intolerant “meer civility,” involves as she puts it, an exercise that moves between “exorcism” and “rehabilitation.” Her exorcism is compelling, and should put paid to attempts to find in Williams a neo-Kantian secular liberal à la Nussbaum, while her twenty first-century “rehabilitation” does not provide the grounds for endorsing the excesses of Williams’s religious alt-right heirs. Between a liberal idealism that seeks to ground politics on ethics and a left-liberal post-colonial critique that rejects civility out of hand, Bejan rather suggests we wish a plague on both their houses. For Bejan, the problem of the profound religious differences of the seventeenth century should not be seen according to the dominant liberal idea of the primordial relationship between religion and violence. Rather, she draws our attention to the actual political challenges of living in common that toleration is called upon to solve, then, and now, questioning a conception of politics as a future state dependant on moral perfectibility. I especially enjoyed her wry comment to the effect that political theorists need to get out more: “it seems reasonable to expect theorists to understand reality first, before moralizing about how to change it.” Indeed, her book manages to refuse the alternatives of a civilitarian evacuation of politics by ethics and a post-structuralism that often relies on a hypostatized or heroic concept of the political, by providing a critique of liberalism as a depoliticizing machine from within liberal thought itself. In what follows, I want to briefly take up her endorsement of evangelical modes and motivations of speech from a perspective that she doesn’t address in the book, and which is perhaps unfairly outside both its interests and purview, but suggests itself to me as a different way of elucidating the promises and pitfalls of her “rehabilitation” of Williams for our current exceptional times. Specifically, I want to consider the relationship between evangelical modes of speech and the problem of truth, a question whose pertinence for our current times of post-truth “alternative facts” seems apropos. Imprecation dramatizes the power of language; a specific form of power also found in cognate types of speech act—oaths, insult, anathema—that institutes a particular relation between the speaker and the production of truth. Implicit throughout the book, but not directly addressed, is the question of how this sort of speech in the public, political realm can be powerful and hence dangerous. All of the three are acutely aware of this power, and whilst Williams’s “meer civility” might be understood as an attempt to safeguard this power of speech to bring about conversion, in different ways, both Hobbes and Locke participate in a re-articulation of the grounds upon which authoritative and powerful speech had hitherto rested. Hobbes’s writing on the dangers of disagreement certainly entails recognition of the power of inspired speech; his goal is not only to control it, but also to undermine its relation to revealed truth. The Spirits involved in inspiration “have their existence only in the fancy, it is nothing but the blowing in of a Phantasme; which is improper to say, and impossible.” Hence the Scriptural reference to divine inspiration, so prized by the prophets and preachers of his day, should be understood “metaphorically onely.” But this dismissal of the supernatural, or theological, ground of speech as “meer” metaphor misses something crucial. For anybody who thinks that to speak about prayer that kills and the peculiar force of other related illocutionary speech acts such as oaths, curses, blasphemy, insult, or even benediction, is to speak “merely” metaphorically, and to confuse, as our tradition had “primitives” and “savages” doing, figures of speech with material reality, signs with things, forgets Aristotle’s insight that metaphors are not confined to the realm of poetics but also belong to ontology. Malediction and related speech acts such as curses, anathema, and insult, while they range from the trivial to the deadly, can be ontologically performative—bringing things and situations into and out of being. The mode and motivation of evangelical speech identified by Bejan taps precisely into this transformative urge, this desire to convert the other, and the powers of speech to transform ways of seeing, thinking, and doing: A power which is, as she rightly sees, its source of political promise, but also, its danger. St. Paul sets out this evangelical mission, which he likens to war understood as a military campaign (strateias), in 2 Corinthians 10:3-6: “For though we walk in the flesh, we do not war in the flesh, for the weapons of our warfare are not worldly but have divine power to destroy strongholds. We destroy arguments and every proud obstacle to the knowledge of God, and take every thought captive to obey Christ, being ready to punish every disobedience.” Evangelical truth is polemical and militant, destroying the arguments of the enemy and converting their thoughts, tolerating no disobedience on the part of the elect. It is a mode of truth that functions on the register of the performative. The sort of act that is at stake in “persecution of the tongue,” or even the “euangelon” conceived as Pauline spiritual warfare, or, as Luther reminded his followers, “a shout,” is not that of regular communication. Rather than conveying semantic content and functioning on the epistemological register of the constative or denotative, these speech acts are performative, a matter of doing things with words. Attempts to mark the difference between Hobbes, Locke, and Williams’s time and our own are often made through careless reference to disenchantment and secularization. Oaths, curses, anathema supposedly wreaked their extreme political mayhem in the seventeenth century because of the worldviews, mentalities, and social conventions that entertained an enchanted view of agency, an acute sense that eternal salvation was at stake and an overwhelming fear of God’s wrath. In Charles Taylor’s immanent frame, we can no longer do things in with words. However, this view runs roughshod over the historical evidence that the invocation of God’s eternal punishment in the oath has never anywhere functioned as an effective deterrent or guarantee. It also forgets that seventeenth century was not simply under the spell of the Christian logos: the cynical manipulation of oaths by royal authority made a nonsense of their supposedly sacred force, while professional perjurers abounded, and a climate of profanity, libertinism and general impiety coexisted with the extremes of piety and conviction that Bejan sees in the “righteous schismatics and enthusiastic evangelicals who were unwilling—or in conscience—unable to hold their tongues or keep their peace.” More importantly, the secularization narrative overstates the role that religion, or the sacred, played in the specific power of “persecutions of the tongue” by attributing to an external supernatural force a power that is internal to language itself. The significance and power of these speech acts depends less on shared belief, mentality, or cosmology than the experience of language as such, an experience which is not primarily epistemological, but ethico-political. To invoke God in the oath, to shout the good news, to anathemize, blaspheme, or curse is to participate in the god-like power of language to name the world, to make or unmake it. It is also to recognize, as Williams appears to have done, that to speak at all is to participate in the promissory structure of language, or what Derrida calls1 its fiduciary form. Unlike the model of deliberative democracy driven by “public reason” or a Habermasian “communicative rationality,” where language is understood as a tool for the exchange of semantic content, the evangelical mode and motivation experiences language as “veridictive,” with both an ontological and ethic-political force, insofar as it enables a new connection between speaking and being where the very being of the subject is put at stake in language. Bejan reveals a Williams who appears acutely aware of the veridictive power of speech, its ethico-political force, and his meer civility should be read as an attempt to safeguard it, for his own salvation, and for others—to keep the conversation going so that it could work its transformative magic. In foregrounding this evangelical mode and motivation, Bejan draws our attention, albeit perhaps not in my terms, to another great insight afforded by Williams’s approach to difference, which is to say, the relation between truth, politics, and partisanship. Williams’s evangelical mode and motivation, just like Luther’s “shout,” did not articulate a truth which took the form of a “neutral,” objective knowledge of “facts” or values upon which we might all agree; rather, his truth was the truth of an engaged subject, a gesture of intense partisanship. In politics, at least in any given concrete situation, truth is by definition one-sided, its universality is and can only be proclaimed from a partisan position. Bejan also recognizes that politics, in its concrete rather than ideal forms, is indeed a partisan affair, as she likens the seventeenth-century “fiery zeal for one’s own sect” to our own “political partisanship and polarization” and argues that “the term “evangelism” captures quite well much of what democratic citizens actually do in the public sphere.” She thus, implicitly at least, seems to agree with Jacques Rancière2 when he argues that “effective pluralism means polemical pluralism”; a pluralism that creates instances of equality through agonistic disensus, partisan disagreement. Rancière holds that we are political beings because we have the ability to put into circulation speech that exceeds the strict function of designation; useless or “barbaric” words whose deployment and circulation will always be countered by those who claim to speak properly. In this sense, “politics is an extreme form of symbolic violence, an inescapable conflict over principles that allows violence to be controlled.” But while it institutionalizes a wrong, this is a wrong that can be discussed. In the evangelical model, we can see the possibility for an effective pluralism in and through disagreement, a pluralism that the Rawlsian or Habermasian model does not offer, insofar as in their conception, the stage of politics has already been built, and the groups who are able to speak on it have been recognized and designated their places on it in advance. There can be no a priori guarantee or reliable safeguard against the worst, against the very real dangers inherent in any militant partisanship, any attempt to suture truth to being. Yet to deny any place or power to activist or evangelical models of truth, in which a saying would be a doing or a making, would seem to run the risk of disqualifying any radically transformative or emancipatory project in advance. There is a fine line between the rhetorical power of the evangelical mode and motivation that engages in discussion, however polemically, and enables it to continue, and the propagandistic that serves to shut it down altogether. 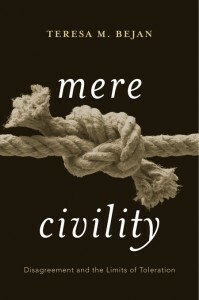 In these times of extreme partisanship, we might want to consider whether exercising “meer” civility might be a way to try and maintain this line.